Continuing the focus on the amazing deals for D&D stuff going on right now, here’s one for the folks who will always believe the revision of 3rd Edition – more commonly called “Three-Five” – stands as the best iteration of the game they love. It’s on sale for $6.95! Tired of hauling all of your D&D rules supplements to the gaming table? Having trouble finding the rule you need? This supplement takes all of the roleplaying game’s most important rules and presents them in a single comprehensive, easy-to-reference volume for players and Dungeon Masters alike. In addition to presenting the rules of the game, this supplement incorporates official errata as well as behind-the-scenes designer and developer commentary explaining how the rules system has evolved and why certain rules work the way they do. For use with these Dungeons & Dragons core books: Player’s Handbook, Dungeon Master’s Guide, Monster Manual. Product History – The Rules Compendium (2007) was compiled and edited by Chris Sims. Note that I don’t say it’s by Chris Sims, because the material in this tome is taken from a whopping 18 other rulebooks. 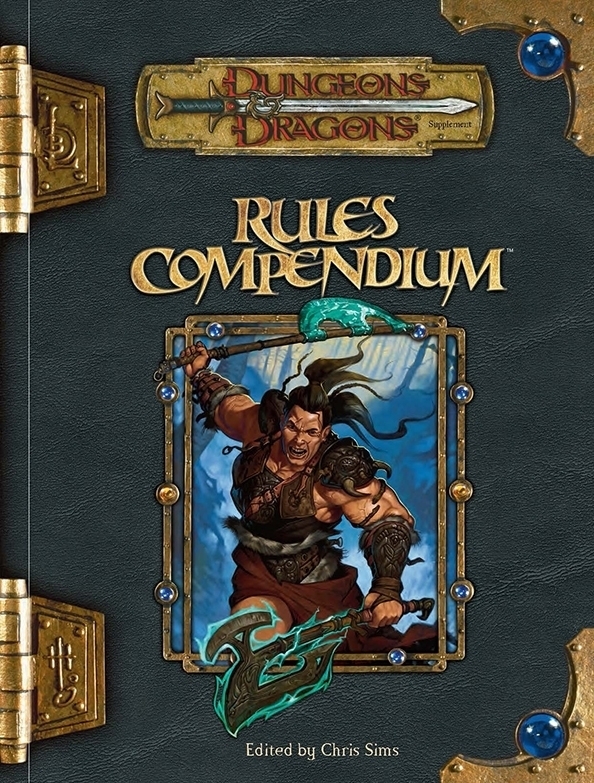 If you’re playing 3.5 D&D and you want a clear and concise quick rules reference without the accompanying flavor text from the original tomes, this is the book for you.